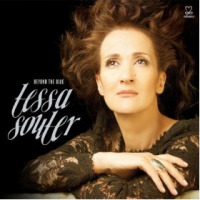 On Souter’s new Beyond the Blue, her fourth CD and second for Motema Music, the London-born Anglo-Trinidadian New Yorker has raised the bar once again. Souter assembled a dozen classical melodies by composers such as Beethoven, Brahms, Schubert, and Chopin. Three of the songs are familiar standards: “The Lamp Is Low” (Ravel), “My Reverie” (Debussy), “Baubles, Bangles and Beads” (Borodin). The others are new standards, with lyrics by Souter. All express the album’s leitmotifexploring the shadows and light of love and intimacy. The concept for the project came from Venus Records’ Tetsuo Hara, who co-produced the date with Jazz at Lincoln Center’s Todd Barkan and who suggested that Souter work with pianist Steve Kuhn and his trio (David Finck, bass, and Billy Drummond, drums). Augmenting the trio were tenor saxophonist Joel Frahm, vibraphonist Joe Locke, and Gary Versace on accordion. It was Venus that originally released Beyond the Blue last year, in Japan only; now Motema Music is releasing the CD to the rest of the world. 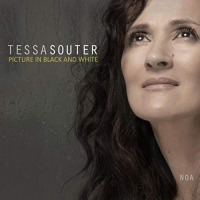 Tessa Souter never planned for an eventual career in music. When she moved to San Francisco from London in 1992, with a background in journalism (including six months as Chief Copy Editor at Elle Decoration and a stint as interim Features Editor for British Elle magazine), her plan was to be a full-time writer. Over the next two years she gradually developed a successful freelance practice writing for major magazines and newspapers, and helped found the Writer’s Grotto, which has become the heart of San Francisco’s vibrant literary scene. Not long after relocating to New York City in 1997, Souter tumbled into what would become a new career as a singer, with the great Mark Murphy serving as her close mentor. By the time she’d released her self-produced 2004 debut album, Listen Love, she had already been headlining performances at major jazz venues in Los Angeles, New York, and London, as well as in Russia, where she now regularly performs to sold-out concert halls. Souter, incidentally, is also the author of Anything I Can Do, You Can Do Better (2006), whose subtitle is “How to Unlock Your Creative Dreams and Change Your Life.” She knows whereof she writes. 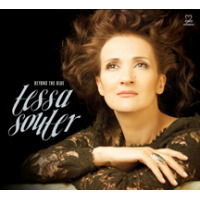 Tessa Souter is looking forward to taking the music of Beyond the Blue to clubs and festivals. She’ll be appearing 5/5 at Chris’ Jazz Club, Philadelphia (Tom Guarna, g; Sean Smith, b; Willard Dyson, d); 5/16 Scullers, Boston (Steve Kuhn, p; Joel Frahm, ts; Gary Versace, acc; Boris Kozlov, b; Billy Drummond, d); 6/4 at the Blue Note, New York (Kenny Werner, p; Joel Frahm, ts; Will Holshouser, acc; Sean Smith, b; Billy Drummond, d); 6/22 at the Rochester (NY) Jazz Festival; and 7/21 at the Marblehead (MA) Jazz Concert Series, Unitarian-Universalist Church. Midwest and West Coast dates for late summer/early fall are in the works.